I recently encountered a scenario like this with extensive and complex application code that made connections to multiple SQL Servers and databases, so tracking down the improper connection string in the application code was proving difficult and time consuming. To aid in the troubleshooting, I created the PowerShell script below that monitors connection pool size and usage by host & host process id in order to narrow down the source of improper connection string(s). Secondly create a “FunctionLibrary.ps1” file containing the Invoke-SQLCmd2 and Write-DataTable custom functions. For more on adding these two functions and their use, see a full and thorough write up at the Hey, Scripting Guy! Blog. (Note that I’ve leveraged some of the concepts from this blog post into my own.) This FunctionLibrary.ps1 file should also be saved in the same directory as the other files listed in this post. Finally, save the PowerShell Script below as a .ps1 file. (In the example shown here, I’ve named the file MonitorConnectionPools.ps1) Just replace YOUR_SERVER and YOUR_DATABASE with a real server name and database in your environment. A great place for this table would be on a DBA utility server or some other non-production server you use for administrative tasks. Note that there is not a host_process_id of “-1”, so the SELECT returns no rows. This just creates the table with the desired structure in preparation for the real writes that will take place later. In the example above, I’ve saved the MonitorConnectionPools.ps1, FunctionLibrary.ps1, and Servers.txt files in a local folder called “C:\Powershell\MonitorConnectionPools“. Use the Set-Location command to navigate to your saved file location. Schedule the SQL Job to run every minute (or two) and it will write connection counts per host & host_process_id to the ConnectionPoolMonitor table created above. The script only collects connections in excess of 25 to avoid excess noise in the table. You can adjust the threshold as needed in the MonitorConnectionPools.ps1 file. Once the SQL Job has been running for some time, review the data collected by querying the ConnectionPoolMonitor table. Look specifically for any instances of “100” (or close to it) in ConnectionCount. If any connection pool timeout errors are seen in conjunction with the 100 connections, there’s likely an ADO.NET connection string that is missing a proper close/dispose command. 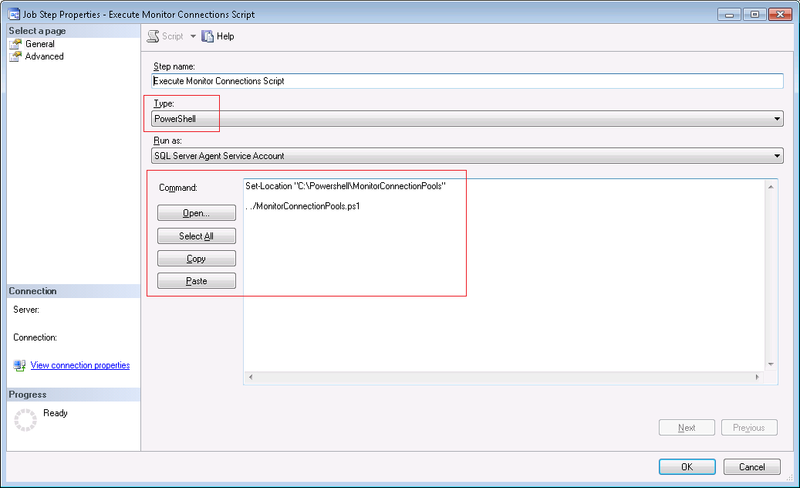 In the example above, host process 4732 using the login name “App_Login” running from the server “App_Host” is consuming all 100 of the connections available in the connection pool. If connection pool timeouts are seen during the time period associated with the CollectionTime above, this would be the culprit. This will show you the name of the application pool with the improperly closed/disposed connection so it can be easily located (and hopefully fixed!) in the application code. 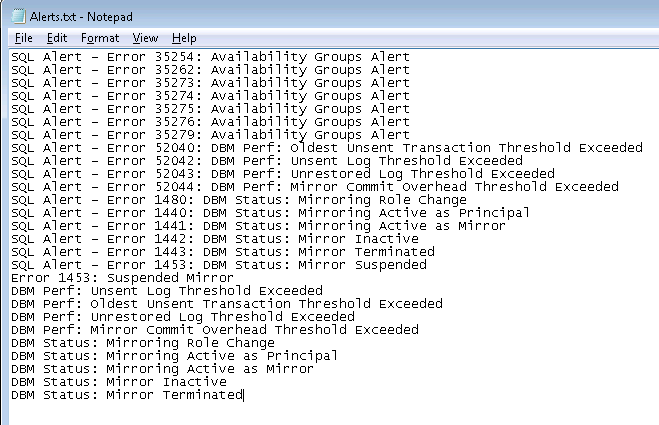 This post is full of a lot of information, but hopefully it will help you on your way to monitoring and troubleshooting ADO.NET connection pooling with SQL Server! When managing SQL Server AlwaysOn Availability Groups and/or standard Database Mirroring, setting up SQL Alerts should be standard protocol. (See this SQL Server Pro article for more background on this.) These types of Alerts can be configured to send e-mails any time the defined event occurs which is great for being notified of unexpected failovers and errors. However, the mass of e-mails generated during a regular planned maintenance that involves one or more failovers can be a little annoying. (Or maybe that’s just me… But if you’re reading this, maybe that’s just you as well. 🙂 I work with dozens of servers that have multiple Availability Groups and Mirrored Databases across them. Whenever we perform planned maintenance, the first thing I do is to disable all Mirroring and Availability Group related Alerts to spare my Inbox from the onslaught of unnecessary SQL Alert e-mails notifying me of the failovers. To do this quickly and efficiently, I’ve written a PowerShell script to disable/enable multiple Alerts on any number of servers automatically. Just add new lines to this file for each Alert you’d like to disable/enable. $Enabled = read-host "Enable or Disable? Please enter '1' or '0'"
Write-Output "Only 1 and 0 are valid entries." That’s all it takes to save your Inbox during a regular maintenance window! When working with many related SQL Servers it can be helpful to review SQL Error Logs on multiple servers all at once while also filtering for certain types of error messages. There are many use cases for this script, but the most common use case I’ve encountered is to check for failed logins and connection timeouts after an Availability Group or Mirrored Database failover. I work in an environment with multiple Always On Availability Groups with dozens of webservers that connect to them via Listeners. When we do regular maintenance such as Windows Patching, we manually failover our Availability Groups as part of the patching process. With one run of this PowerShell script, we can ensure there are no failed logins or connection issues once the failovers and maintenance have been completed. Some of our Availability Groups span up to five Replicas, so there have been occasions where our Logins are out of sync. In the example above, we’re looking for any error message containing “login failed” or “connection timeout”. Any number of different filter criteria can be included in the search by simply adding a new line to this file. Leave blank to omit the date time filter. Once you’ve created the CheckErrorLogs.ps1 and the two text files, open a PowerShell window and execute the script. In the example below, I’ve saved all three files to the folder “C:\PowerShell\ReadSQLErrorLogs”. Enter a minimum date to filter for recent error messages only, or leave it blank to get all error messages in the current error log. Finally, the results are output to a grid view for easy review and sorting. Hopefully, this will save you a lot of time and effort when you need to review multiple SQL error logs! I work in an environment with dozens of production SQL Servers with seasonal peak workloads occurring twice yearly. One of my team’s tasks prior to each peak season is to confirm that each of our production SQL Servers have these specific permissions enabled. This can be accomplished by logging on manually to each server and reviewing the User Rights Assignments of the Local Security Policy. But who has the time for that?? (Or, this could be a great job for the intern… 🙂 To accomplish this task efficiently via automation, I’ve written a PowerShell script that will iterate through a list of servers and return the requested Security Policy information. Once you’ve created the ValidatePermissions.ps1 file and the Servers.txt file, open a PowerShell window and execute the script. In the example below, I’ve saved both files to the folder “C:\PowerShell”. If any of the SQL Servers checked were lacking permissions, a “0” would return instead of a “1“. Rather than spending 20 minutes checking these servers manually, we’ve now confirmed the appropriate permissions in seconds! This script can be run anytime as needed with no further configuration. Hopefully, this timesaver will allow you more of an opportunity to work on your 9-iron!